At Fernmark, we have a beautiful workshop and/or meeting space suitable for holding small seminars and workshops. 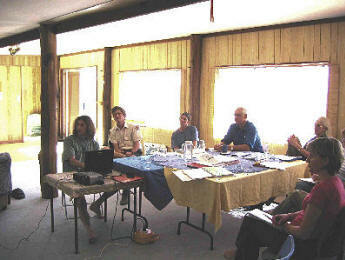 Our Studio can easily accommodate up to 20 workshop attendees. Catering: No need to worry about the catering . We prepare all meals and morning & afternoon tea breaks. Your workshop will have have fabulous food and excellent service all served at the time you pre-designate. All meals are vegetarian or fish and we can provide food for people with food restrictions or allergies. Fernmark Inn guestrooms are available for your group or business to use when booking the meeting room space. When booking all 4 rooms, you receive a special discount of 15% and the meeting space is yours at no extra charge. Workshop participants can relax and socialize in the guesthouse lounge area and gardens after hours. If other lodging is needed we can arrange it with nearby Cottages. Please contact us for more information. Please e-mail us with any queries or requests.